The 1933 running of the Mannin Beg race around the streets of Douglas, Isle of Man took place on Wednesday 12th July. While 20 cars entered just 14 started, including ‘Billie’ Sullivan’s Morris Minor. Sullivan and ten others failed to finish the gruelling 50 lap, 230 mile race, the eventual winner being Freddie Dixon in his Riley. Two C Types Midgets finished, second place going to car number 4 (Mansell), with the Ford/Baumer car (no.12) finishing third. 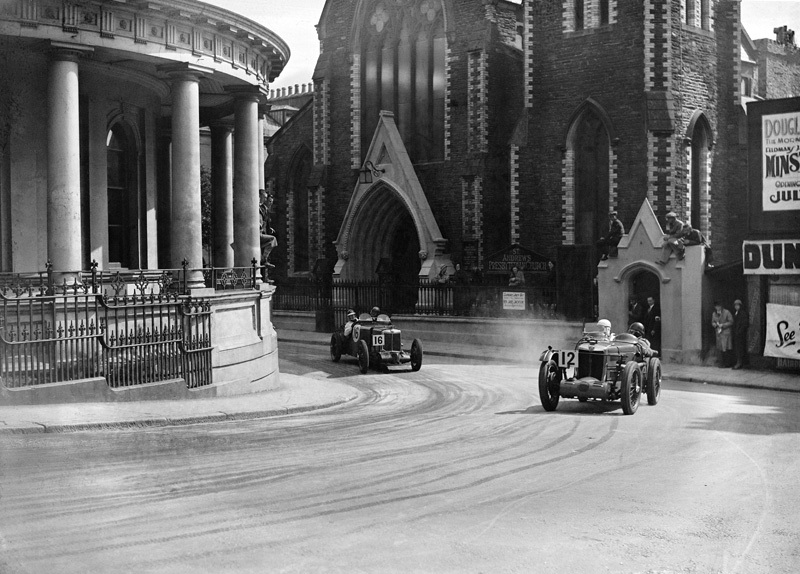 Here Hamilton’s Magnette (16) trails the Ford/Baumer C Type at St. Andrew’s Church on the corner of Finch Road and Prospect Hill. Although Hamilton set the fastest lap time of the race he was to retire after 35 laps with a back-axle problem. This superb image is available from LAT Images – quote reference LATplate C1044 when enquiring. NB Why the single front wing on the Ford/Baumer C Type?